As each year passes, the accessibility of information increases while at the same time there is an equal increase in bad information. Much of this bad information comes from a lack of expertise and skill with a healthy dose of sloppiness. An audience of watchers and viewers comprised of people with even less expertise makes them perfect for advancing bad information. There is an overabundance of poor technique and flat out wrong information permeating throughout the coffee industry. There is no beauty in bad information. Bad information leads to an ugly tasting cup of coffee. Siphon coffee brewing is near and dear to me. I'm pretty good at it - not that articles, awards, and acknowledgement from peers means anything, but... it does. 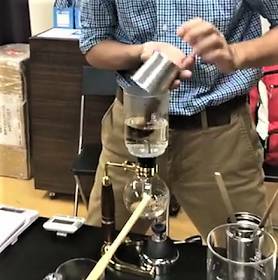 There's not a lot of siphon brewing going on out there compared to other forms of coffee brewing, and most of it is being done wrong. 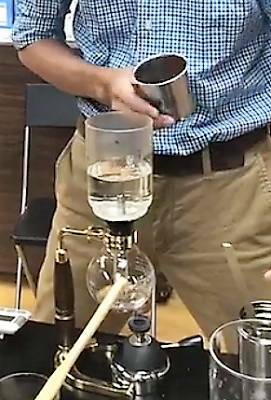 A video from the World Siphon Brewing Championships was sent to me and it was disturbingly bad. It was no surprise when the person who sent it was told "the coffee is terrible". I have also seen countless badly executed cups from a certain company's "Reserve Bar," and it's the perpetuation of bad information and poorly executed coffees that continues... and that is bad. Here are some screenshots from a recent video of a "professional demonstration". I did my best to conceal the identity of the subject, but it is what it is. The first thing that clearly illustrates this barista's lack of expertise is something that I can't show because it didn't happen. Fresh grinding. I have no idea when the coffee was ground, but it certainly was not ground immediately before brewing as there was a lot of lead time and no coffee grinding. Any time before the video started would have been too long. 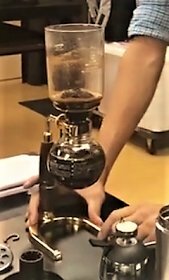 This shows a lack of care in one of the most essential steps for any coffee brewing and even more important for a demonstration of craft-brewed coffee. Unprofessional. This first picture below shows the water ascended into the top flask of the siphon. This is a clear indication of lack of understanding of the most basic coffee brewing principles. The next picture will show why. The horror! The horror! If you are a coffee professional and are not cringing at this, maybe you should rethink your profession. Here's the issue:*Think about every other coffee brewing technique you know. The water meets the coffee. The coffee does not meet water. *Pour over/Drip - coffee grounds in a cone, water poured over coffee grounds. French Press - coffee grounds go into the press pot and water is poured in. And the principle holds true for espresso - coffee grounds go in the portafilter and the water comes down to meet them. This is a basic nuts and bolts explanation: The importance of pre-wetting and even, controlled saturation allow for the water to penetrate and work its way past the surface of the cellular walls and bring out the oils out from within the tiny cellular structure of the coffee. Having all the grounds hit the water at once do not allow for any gradual or even pre-wetting and the immediate exposure to the full temperature of the water causes only the oils from the outermost cells to "pulse" out while essentially sealing the other flavorful oils within the deeper cellular structure. So in a nutshell, If you don't have proper order of technique, ... "water meets coffee," then because of what happens to the oil and because of what doesn't happen to the oil you create both off flavors and an incompleteness of flavors... not so much in intensity, but very much so in terms of nuance and dynamics. In this next picture there are two problems that I notice one of which goes back to the beginning. And if you start with bad technique then you are likely to finish with bad technique. The first problem: Look at the top of the siphon, at the haphazard mess of grounds there. No even dome. No real dome at all. So no stirring immediately after brewing which compromises the extraction that occurs during the draw down. It takes time to develop expertise. Those who have some level of expertise never seem to be satisfied with the status quo -- which is why they were able to achieve a notable level of skill in the first place. Whatever your craft or discipline happens to be, don't be blinded by fancy words, strong personalities or great branding. It's a combination of laziness and not caring that leads to the dissemination and acceptance of bad information. Take the time to use your mind to assess, to understand, and to know the difference between good and faulty information. Whether it's brewing coffee or life in general, don't be sloppy when you can make something beautiful. Last edited by John P; 10-02-2017 at 01:20 AM. Very interesting and absolutely correct, thanks. Thank you. Nothing is more irritating to me than so called professionals perpetuating bad information and bad coffee year after year. A sad reality.